Acute shortage of electricity in the Sub-Saharan Africa has left its countries struggling for economic growth. The energy crisis in the continent was recently analysed by McKinsey & Company in their report titled “Brighter Africa - The growth potential of the sub-Saharan electricity sector”. 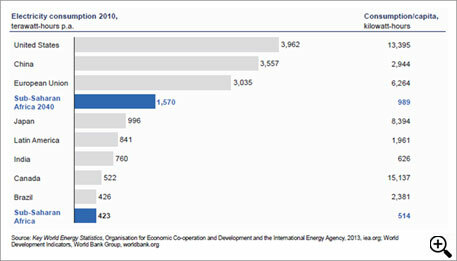 The reports states that electricity access in sub-Saharan Africa’s situation is among the world’s worst. With 13 per cent of world’s population, the region has 48 per cent of its population without access to electricity. The only other comparable region with a similar imbalance is South Asia, with 23 per cent of the world’s population and 34 per cent of the people without access to electricity. This means that almost 600 million people in sub-Saharan Africa lack access to electricity. Only seven countries—Cameroon, Côte d’Ivoire, Gabon, Ghana, Namibia, Senegal and South Africa—have electricity access rates exceeding 50 per cent. The rest of the region has an average grid access rate of just 20 per cent. Even when there is access to electricity, there is not enough power being generated to reach all. 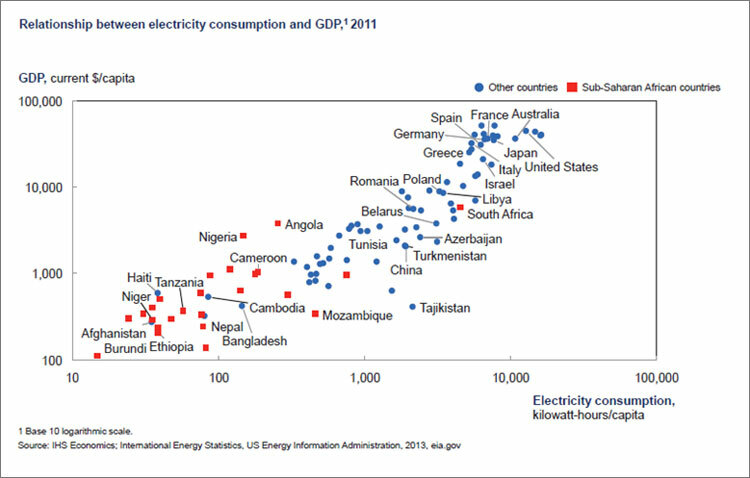 The report also highlights that electricity consumption rates in Africa are far below other emerging markets. 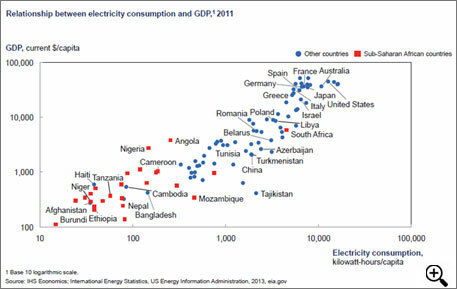 Average electricity consumption in Sub-Saharan Africa, excluding South Africa, is only about 150 kilowatt-hours per capita. This is a fraction of consumption rates in Brazil, India, and South Africa. The region’s power sector is significantly underdeveloped in all aspects such as energy access, installed capacity and overall consumption. 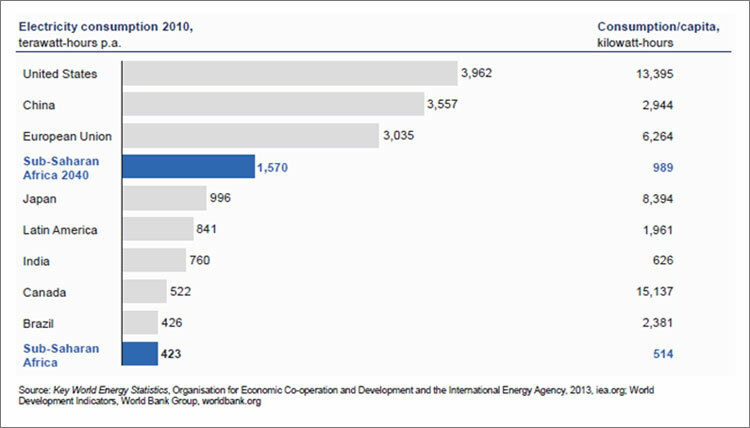 The analysis finds that countries with electrification rates of less than 80 per cent of the population consistently suffer from reduced Gross Domestic Product (GDP) per capita (as shown in the figure below). The only countries that have electrification rates of less than 80 per cent (with GDP per capita greater than US $3,500) are those with significant wealth in natural resources. Angola, Botswana, and Gabon, despite falling in that category are not economically prosperous ones. Obtaining access to electricity and consumption are the two most important metrics that can indicate the degree to which the power sector is supporting national development. The report projects that Sub-Saharan Africa will consume nearly 1,600 terawatt hours by 2040, four times of what was used in 2010. That forecast has been computed based on a number of important factors, including a fivefold increase in GDP, a doubling of population, electricity-access levels reaching more than 70 per cent by 2040, and increased urbanisation. By 2040, the region is expected to consume as much electricity as India and Latin America combined did in 2010. Yes. Sub Saharan Africa should go in for small decentralised renewable energy systems on a massive scale. One area that offers great promise with least cost is Biofuel/biogaspower and Bio char from Care free growth,regenerative and CAM plants like Agave and Opuntia in the millions of hectares of waste land.